Are you looking for a non-abrasive, non-surgical alternative to treating skin cancer and actinic keratoses? Photodynamic Therapy at Plateroti Dermatology may be right for you. This light-based treatment is used for a wide range of skin conditions and is clinically proven for safe, effective skin correction for skin cancers, actinic keratoses and more. Serving Templeton and surrounding areas in California, our medical team is led by Dr. Carmelo Plateroti. Contact us today to schedule a consultation and find out if you are a candidate for photodynamic therapy. While laser-based treatments emit controlled laser beams into the skin, photodynamic therapy is a light-based solution that promotes healing underneath the skin surface and gradually resurfaces aging and damaged areas. This therapy is often paired with a light-activated medication for maximum skin penetration and healing. The best way to determine if photodynamic therapy is right for you is to schedule a consultation with Dr. Plateroti at our Templeton office and have your individual condition evaluated. Prior to your treatment, we will cleanse your skin or excess oils and surface debris to allow for maximum penetration underneath the surface. Then, a photosensitive medication will be applied to the treated area and left to absorb into the skin for a set amount of time depending on the level of reduction needed. Once the medication has set, a bright light will be activated and exposed to the skin with a wavelength that has been specifically chosen for your condition. The skin will then absorb the light energy and destroy areas of the skin that have been damaged due to skin cancers or actinic keratoses. Photodynamic therapy stimulates the skin’s natural healing process, promoting the production of new collagen and elastin to remodel the skin from the inside out for an overall smoother, softer, healthier complexion. What are the Benefits of Photodynamic Therapy? After receiving photodynamic therapy, it is often advised to use proper precautions in the sun to protect your skin from further damage. Depending on the level of correction needed, patients may experience slight flushing or redness afterward, which should subside in one to two days. 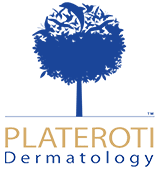 Contact Plateroti Dermatology today to schedule a consultation at our Templeton office and find out if photodynamic therapy is right for you.